Prominent & Leading Manufacturer from Vadodara, we offer embroidered kurti with jacket, cotton embroidered kurti, indian kutch embroidered kurti - top - fancy embroidered kurti, ladies cotton kurti, floral embroidered kurti and ladies embroidered cotton kurti. Being an eminent organization in the industry, we are involved in providing a premium quality range of Embroidered Kurti With Jacket. We are a reputed name in the industry, devoted towards offering the best quality array of Cotton Embroidered Kurti. Owing to our enriched industrial experiences, we are committed to providing a wide variety of excellent quality Fancy Embroidered Kurti. 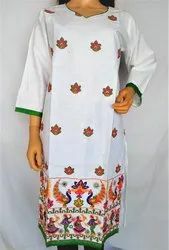 Driven by a vision to achieve significant growth in this industry, we are providing a premium quality array of Ladies Cotton Embroidered Kurti. 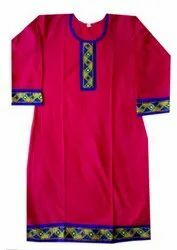 We are the leading manufacturers of Ladies Embroidered Cotton Kurti.